Posted by Teresa Mihelic HelpDesk on Thursday, November 8th, 2012 at 6:03pm. Nothing shows better that the Holidays here like the good old 'Christmas Tree Lighting Ceremonies'. In Orange County we get so lucky with so many places that we can go and witness these ceremonies, but also most of them also have some extras, like a visit with Santa, hot cocoa and activities for the family. Here's a list of our most famous tree lighting ceremonies going on in South Orange County this Winter 2012. All of these are great events that will kick-off the holiday season! Mickey Mouse and his pals bring yuletide cheer and holiday greetings from "The Merriest Place on Earth" as we kick off a bright holiday season with a dramatic and festive Tree Lighting Ceremony on November 13 and 14 at 6pm! Enjoy the first big tree lighting ceremony in Orange County as well as the only one in Southern California to feature magical guests from the other favorite Orange County destination for the Holidays...the Disneyland® Resort. This is a free event and will be held in the Neiman Marcus-Bloomingdale's Courtyard at 6pm both nights with exclusive performances which will culminate in the lighting of our stunning 92-foot Christmas tree. This one is one of our favorites. 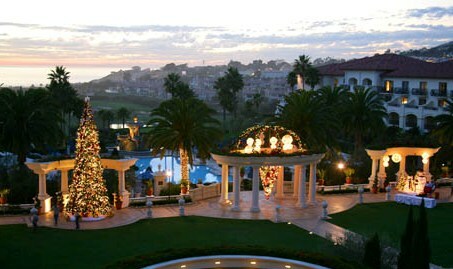 The resort does a really great job on getting that cozy Holiday spirit. The free event includes holiday music and a visit by Santa Claus. This event starts at 4:30-6:30 p.m, also featuring a special and annual Sand Sculpture Dedication. This year they have a special guest host: actress Tori Spelling and raffle tickets that will go towards Make-A-Wish Foundation. Gather your friends and family for a very special evening of holiday carolers, hot cocoa, children’s activities, live music and our traditional tree lighting — all in a beautiful oceanfront setting. The event will feature holiday performances, music and refreshments and an appearance by Santa Claus. 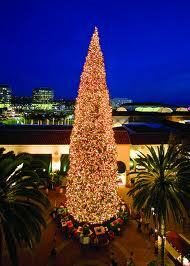 The festivites will culminate with the lighting of the large redwood tree adjacent to the Kate Wheeler Library. From 5:30p to 7:00pm at Irvine Ranch Historical Park in Irvine. In conjunction with the City of San Juan Capistrano’s annual Tree Lighting Ceremony and community-wide holiday celebration, Mission San Juan Capistrano will host Christmas at the Mission on Saturday, December 1st, 2012 from 5:30 p.m. – 8:00 p.m. This is a really well done event, featuring local music performance groups, “Santa’s Workshop” with cookie decorating for kids, Food Vendors serving tamales, pizza, hot cocoa, sweets and more. Tickets will be sold before and at the event ( $5 adults, $3 children). Dress warm. Yes, it is Orange County and we brag about it being nice and warm, but all the tree lighting ceremonies take place after dark, and the weather can drop a lot, so bundle up! Bring cash, just in case! Although the tree lighting in most cases is a free event, some of the ceremonies will have food and shopping from local vendors.